The 2013 git-annex user survey is in progress here. What directory should the Android webapp default to creating an annex in? Same as the desktop webapp, users will be able to enter a directory they want the first time they run it, but to save typing on android, anything that gets enough votes will be included in a list of choices as well. My goal for this month is to get more people using the git-annex assistant, and fix issues that might be blocking you from using it. To do this, I'd like to get an idea about whether you're already using it, or what's keeping you from using it. If you use git-annex at the command line and have no reason to use the assistant, please instead fill in this poll on behalf of less technically adept friends or family -- what's preventing you from introducing them to the assistant? Feel free to write in your own reasons, or add a comment to give me more info. Note: Poll is now closed. Nearly all these issues have been dealt with. Please file bug reports if any of these issues still affect you. Background: git-annex supports storing data in various special remotes. The git-annex assistant will make it easy to configure these, and easy configurators have already been built for a few: removable drives, rsync.net, locally paired systems, and remote servers with rsync. Help me prioritize my work: What special remote would you most like to use with the git-annex assistant? This poll is ordered with the options I consider easiest to build listed first. Mostly because git-annex already supports them and they only need an easy configurator. The ones at the bottom are likely to need significant work. See cloud for detailed discussion. Have another idea? Absolutely need two or more? Post comments.. 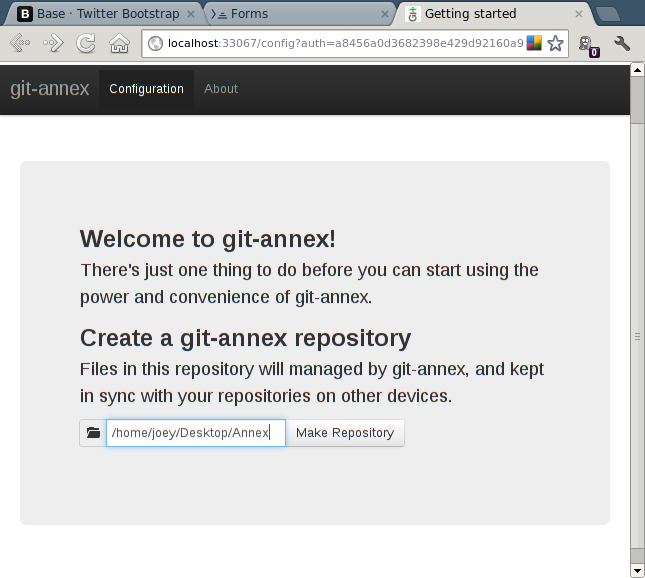 Started work on the interface displayed when the webapp is started with no existing git-annex repository. All this needs to do is walk the user through setting up a repository, as simply as possible. A tricky part of this is that most of git-annex runs in the Annex monad, which requires a git-annex repository. Luckily, much of the webapp does not run in Annex, and it was pretty easy to work around the parts that do. Dodged a bullet there. There will, however, be a tricky transition from this first run webapp, to a normally fully running git-annex assistant and webapp. I think the first webapp will have to start up all the normal threads once it makes the repository, and then redirect the user's web browser to the full webapp. Anyway, the UI I've made is very simple: A single prompt, for the directory where the repository should go. With, eventually, tab completion, sanity checking (putting the repository in "/" is not good, and making it all of "$HOME" is probably unwise). Ideally most users will accept the default, which will be something like /home/username/Desktop/Annex, and be through this step in seconds. Suggestions for a good default directory name appreciated.. Putting it on a folder that will appear on the desktop seems like a good idea, when there's a Desktop directory. I'm unsure if I should name it something specific like "GitAnnex", or something generic like "Synced". Time for the first of probably many polls! What should the default directory name used by the git-annex assistant be?